Femi Oye displaying his biofuel gel that can be used for cooking with his company’s cook stoves. Green Energy & Biofuels is a Nigerian based eco-friendly company, officially founded at the beginning of 2013, that aims to end kerosene usage. It manufactures cook stoves and a cooking biofuel gel, made from waste products such as sawdust and hyacinth. 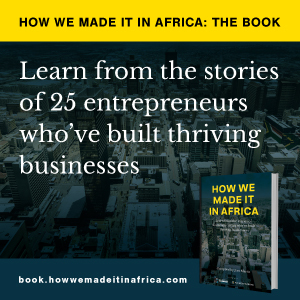 How we made it in Africa spoke to the start-up’s founder, Femi Oye, about his business model and some of the lessons he has learnt as an entrepreneur. Starting out was chaotic. To be great, you need to start with a bold idea while keeping a clear vision of the future in your head. I started with my savings, which were only US$500. It was hopelessly too little. So I joined a MLM, a multi-level marketing company and in 12 months, I was able to raise more than $50,000, enough to start my dream business. The next challenge was to grow and expand the business. I participated in accelerator programmes and business plan competitions. I also began writing grant applications and making presentations to investors, highlighting my great products. And more than $2 million has been raised through those efforts, always stressing favourable social impacts. 2. If you were given $1m to invest in your company now, where would it go? Directly into expanding our ongoing modular micro bio-refinery plants in Africa. An additional $2.5m will be matched to install a cellulosic second-generation bioethanol plant that will produce additional 500,000 gallons of biofuel per year. An investment capable of generating an internal rate of return (IRR) of 17% by the company’s anniversary. The greatest and wildest risk to our kind of business is innovation, and the second is change. We operate in an infantile but disruptive technological space. The rules and game keep changing every nanosecond. So to continue to win and evolve, we must keep innovating, and develop a strong and motivated team. Competition can be fought, government policy and regulation can be complied with, but embracing change is dogma itself. 4. So far, what has proven the most successful form of marketing? Success in effective adoption of renewable energy products in a developing nation is largely based on market education, engagement and rewarding incentives. We engage a network marketing distribution model. What we have done is to allow customer-participatory organic growth integration, then drive the adoption while investing in training, support materials, and incentivising our green entrepreneurs. We decided to segment and rely on a social one-on-one referral introduction of our products to the customers, and have focused on allowing one person to introduce our biogel and stove to another, thereby giving power to the people. Meanwhile, we continue to provide support, training and education, incentives and leadership as the organisation expands and grows. We observed that when peer-recommended, people will continue to use the product and will either re-order more from the same friend, or simply become a distributor themselves. We have a mentor-driven network marketing model for distributing the products to the last-mile users. In the past three years, our distribution agents have soared to 22,000 and the number continues to climb. Since Nigeria is a huge market, we were careful not to sell a clean cook stove to customers we cannot support through our fuel distribution network. Our social marketing model helps ensure we deliver our products effectively at the lowest cost possible. Cook stove entrepreneurs sign up distributors and educate our target market. Entrepreneurs receive compensation as a share of the total sales generated, and its equivalent carbon credit aggregate on a monthly basis. The life of an entrepreneur is filled with crises, chaos and celebrations. I have experienced each one at every stage of my life. For me, it’s the feeling that things are working out after all our invested energy, effort and expectations. At a time, it was the thrill of selling the first bottle and cook stove to the first customer. While that lasts, there also came a desire to satisfy the needs of a fast-growing market. Defining moments include the times we received praise from, and saw change in the lives of, female entrepreneurs. It’s gratifying to know how much of a difference a little product can make. Never mind lifting their incomes, it can help protect the health of women and reduce environmental pollution. 6. What has been your biggest mistake, and what have you learnt from it? Surround yourself with great people – ignore naysayers and work with those who encourage you and remain positive all the way. Look for mentors – if you don’t have one, find one. Success is unpredictable, sometimes it will come, other times not. And remember sole business owners also need a boss. Build partnerships and networks. Sometimes the more you can do is all you can do. To succeed beyond your imagination is worth more than the words of validators and the quality of endorsements. The sum of your life depends largely on co-operation with the alliances you are able to form.